Holtkotter was really the first to have the adjustable, long pendants like this. Recently a lot of people have knocked them off, but their hardware and design is always top-notch and is never really knocked off very well. 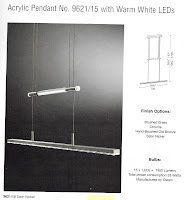 This LED piece has that wonderful pull-down capability, and it's the first one of its kind that I've seen. It comes in 4 finishes: Satin Nickel, Chrome, Hand-Brushed Old Bronze, & Brushed Brass. It emits 1350 lumens, but it only uses 28 watts! Amazing! I know a lot of people have drum-shaded pendants, but this one speaks to me for some reason! It has what we call a 6-way lamp feature ~ it has a 3-light cluster plus 1 more socket towards the top, all which take 100-watt lamps, with two pull-chains to operate them. So you can have 1, 2, or 3 of the light bulbs in the cluster on, and then you can pull the other chain to have the 4th bulb on top come on. This one also comes in 4 finishes: Satin Nickel, Hand-Brushed Old Bronze, Antique Brass, & Polished Brass/Brushed Brass. There are also 4 shade options: Kupfer, Kupfer Diamond Logo, Satin White, & Satin white Diamond Logo. Gorgeous!